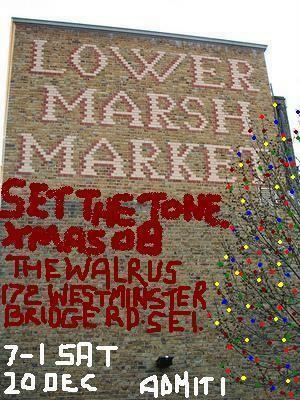 London’s popular ska and reggae club Set The Tone 67 is having a special Christmas party later this month. The ‘rogues in brogues’ Dean Thatcher and Stephen Saunders step out of The Social for this one-off occasion, and instead invite you to The Walrus in Waterloo on Saturday December 20th for a ticket-only bash. Guest DJs on the night will be the ever reliable duo of French Fred and Kerry Foster. For more information and/or to purchase tickets message the Set The Tone 67 Myspace page here, or email Dean directly here. The gang are back at The Social for their 5th anniversary do on Saturday January 24th.